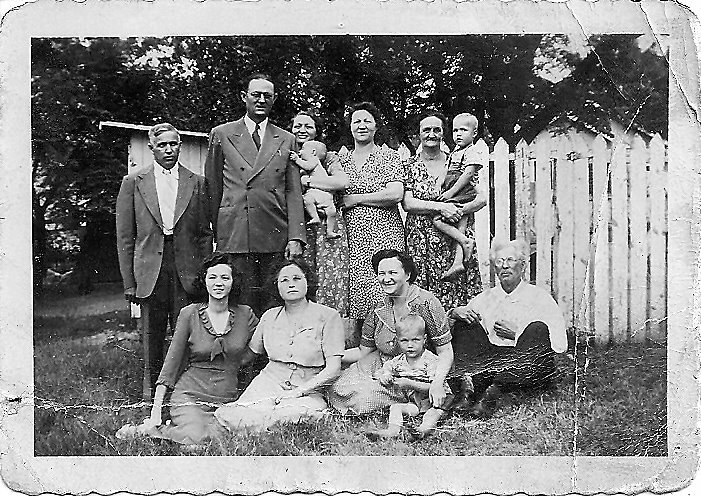 Back Row, left to right: Joe Livesay, Oscar Baker, Mary (Baker) Fain – [holding me Estal Fain], Sophie (Baker) Livesay, Lila (Wallen) Baker, wife of Alfred Baker – [holding Manuel Fain my brother]. Front Row, left to right: Eva (Baker) King, Eva (?) Baker – wife of Oscar Baker, Stella (Baker) West – [child Stanley West – Stella Baker’s son], Alfred Baker – my grandfather. Visited the Livesay farm many times for Baker family reunions when Joe and Sophie Livesay were living. I now live in Johnson City TN, my Fain forefathers (Nicolas Fain) settled in Knob Creek community near Johnson City TN in 1753, my grandchildren Jackson and Zoe are the 10th Fain generation in the USA. I’m learning more about the Baker clan, it appears that Big Andy Baker came to the US through Boston, MA. The Fain’s and Baker’s inter-married throughout the generations. My Great Grandmother was from Blackwater, Virginia. Her name was Sarah Ellen Baker born in 1869 (I believe) Anyway, she married a Daniel Johnson and they had met at a General Store in Blackwater. As a child, I have been to the old Baker home place in Blackwater. It was a two story white house. I had met some of my relatives still living there…I think one Baker man who was a bachelor, and another lady lived there with her husband who was a Baker. I see these pictures above, and I am astonished at how much we favor in appearance (As a great granddaughter to Sarah Ellen Baker we very much favor, as well.) Daniel and Sarah had 5 or more children…Hobert,Tyler,Ina Grace,Hattie,Chelsea Hazel,and Irene..Great Grandfather Daniel was born in 1855 and from what I have been told pretty much followed the railroad for work. They moved to Newman’s Ridge in Hancock County, Tennessee to Lone Mountain, Tennessee in Claiborne County to Tiprell,Tennessee to Cumberland Gap, Tennessee and are now buried in Harrogate Cemetery in Claiborne County,Tennessee. They were very good people. The name Jane Testerman comes up in our family tree, and I believe that was Sarah Ellen Baker’s mothers name. We went to her grave near the house in Blackwater. Something on the stone said, she was good and faithful, I believe. This was the 1960’s, when I went there and I was about 10-12 yrs.old. Besides my email address, you can find me on facebook, under Janet Lynch (my married name) of Cumberland Gap, Tennessee. I’d love to hear from you.